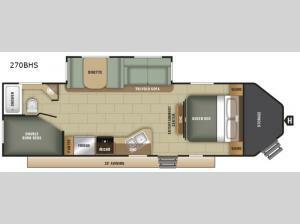 For your next family vacation choose this single slide out Starcraft GPS 270BHS travel trailer. This model is ideal for the outdoorsy family who likes to camp but also enjoys spending time fishing or kayaking. In the front Starcraft Storage Locker you can easily store all of your outdoor camping gear. At night come back to the comforts of your trailer. You will find plenty of sleeping space with the front bedroom, rear set of double bunk beds, and you can even convert the dinette and tri-fold sofa into additional sleeping spots. The 20' awning provides plenty of shade during the day from the sun and is a great area to sit and reminisce about your day of outdoor fun!